Moscow’s attempts to expand the Eurasian Economic Union, latterly with statelets, continue to meet resistance. The Eurasian Economic Union (EEU) still remains a few months from formalization, but a growing number of questions are being asked about the group’s growth and direction continue. Ukraine, Georgia, and Moldova have oriented toward Brussels, while Turkmenistan, Uzbekistan and Azerbaijan continue to show scant interest in the Moscow-led grouping. Armenia and Kyrgyzstan stand as the only legitimate candidates for enlargement, with Tajikistan consciously remaining at a distance. As such, instead of recruiting more states to join the would-be “geopolitical pole,” Moscow has turned toward another avenue for expansion: the unrecognized statelets dotting the post-Soviet landscape. While Transdnistria and South Ossetia have been largely quiet on the matter, Abkhazian politicians have made noises about joining the EEU. Likewise, representatives from “Novorossiya” – the fanciful name Russian-led separatists have given themselves in Ukraine – say they intend to join the union. However, before Russia can rope these frozen conflicts further into Moscow’s fold, it must deal with a relatively unlikely obstacle – and it will have to deal with it quickly. 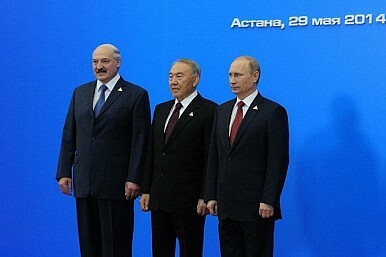 During the May 29 summit in Astana, which saw the heads of Kazakhstan, Russia and Belarus sign the formal EEU documents, Kazakhstan President Nursultan Nazarbayev abruptly blocked Armenia’s planned promotion to full membership in the union. Citing a letter from Azerbaijan President Ilham Aliyev, Nazarbayev noted opposition to the proposal to accede Nagorno-Karabakh along with Armenia. Only states within their UN-recognized borders were to be allowed in, added Nazarbayev (Crimea notwithstanding, for reasons that remain unexplained). According to all reports, Kazakhstan has stood by its stance. In the meantime, Armenia has experienced – or caused, depending on your interpretation – delay upon delay in the process of accession, much to Putin’s chagrin. And with only a few days remaining until the October 10 proposed promotion of Armenia to full membership, the question becomes all the more pressing. It’s also become all the more confusing. On September 25, reports began surfacing that Armenia had swallowed Kazakhstan’s resistance and would be leaving Nagorno-Karabakh outside the EEU’s customs borders. According to one local NGO, numerous customs checkpoints were planned. Not only did this contradict earlier claims from Yerevan, but it went against the position of the majority of Armenians and undercut Moscow’s insistence that Nagorno-Karabakh issues would not impede Armenia’s accession. Just a week later, however, Nagorno-Karabakh officials pushed back at the reports. “Establishment of [a] customs checkpoint, necessitating border control by defense guards, is impossible, since [it] isn’t technically feasible to maintain control over the scores of roadways connecting Karabakh with Armenia,” Araik Harutyunyan, the declared prime minister of Nagorno-Karabakh, said. With only a few days until Armenia formally joins, the question on Nagorno-Karabakh still stands – another thorn in Putin’s side, another prick deflating the EEU’s proposed geopolitical pull. Like Kyrgyzstan, Armenia has already experienced numerous, still-unexplained delays over the summer in the move toward accession; it is entirely possible Moscow may be forced to swallow another delay. Dealing with statelets may turn out to be just as tough as appealing to the states Putin believes remain in Russia’s sphere of influence.